is a ritual that all kids are forced to endure not just on the day of, but for decades (I wish) to come. Forced smiles in front of a staged backdrop that implies serious learning is going on when glamour shots is not in town will be pulled out for years to come by proud parents and grandparents to the total embarrassment of the pictures’ subjects. Javier usually likes to ham it up, which makes overpaying for these pictures bearable – for me anyway. Photos of Javier in a library setting where you can tell that he has pushed the buttons of every person there and is quite pleased with his achievement of driving everyone mad – those are my favorite. Javier attends the Henry Viscardi School, an institution of learning for children with physical disabilities. An amazing staff aided by amazing technology erases all boundaries and physical limitations, pushing each child to achieve their personal best. While most children with degenerative illnesses do not begin attending Viscardi until they are ‘in a chair fulltime’, Javier started there a bit before that. We made the transition a little early in part because of difficulties in the mainstream setting, as well as that we didn’t want his arrival there to seem like some kind of punishment for losing the ability to walk. Javier is a really competitive kid who is like a prisoner, trapped in a body that can’t keep up with the level of energy and appetite for trouble he has. Last year when the majority of his class was seated in wheelchairs for the class photo, Javier was standing, leaning against one of his classmates’ chairs, loving the camera and every minute of being one of the few people standing in the room. The school had asked for volunteers to help with picture day. Needing to be at work, my sister Anastasia volunteered to help out in my place. As usual, Javier played her like a violin, convincing her to stick around a few hours after the photos and chauffeur him home, saving him the hassle of riding the bus. One would think that she’s such a pushover because she doesn’t spend enough time with him to know his shtick but that’s not the case; she spends plenty of time of him, knows his shenanigans but still willingly lets him get his way, even when it means going out of hers. Having boots on the ground, an eye in the sky is always nice for me because I get to hear about Javier’s behavior when I’m not there to yell at him, plus helps me keep up the facade about how I see everything he does, all the time, no matter where I am in relation to him. Yes, this has presented its challenges at times; he will on occasion hide in a closet and ask me to use my powers to see how many fingers he’s holding up. So far, I’ve been pretty lucky and he’s also not really great at hiding so my claim of possessing super powers remains credible. When Stasia dropped him off she mentioned how tired he was all day and that he chose to remain seated for both his individual and class photos. This remark, passed to me quickly while we were both rushing was no casual statement; Javier would never sit in a room full of seated people unless he really couldn’t stand. What happened to the boy who relished the opportunity to be the only one standing? looking at the bronzed baby shoes on a shelf in the living room; one of my mother’s own, one of mine and one of Javier’s all lined up (my mom has the second of each). I remembered buying Javier that first pair of walking shoes and when he outgrew them, maintaining the family ritual of having them bronzed, which meant little to me at the time other than I was following some tradition. I put off buying Javier his current pair of shoes for as long as I could. The summer was clearly over but he was still in his sandals because I couldn’t bring myself to get this current pair of shoes; I knew when I bought them that they would be his last pair of walking shoes. 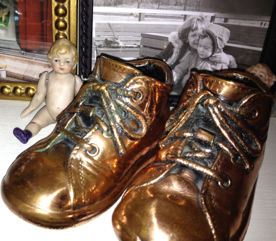 Age 8 and I could bronze his last walking shoes and they wouldn’t look that much bigger than the first pair. I am not sure where this is going but I know that as long as I have a breath left in me, I am going to fight to buy Javier more time. He may be wearing his last pair of walking shoes but he’s still got a lot of ground to cover and I am going to see to it that he does. Thanks for listening and for the support that keeps us moving forward.